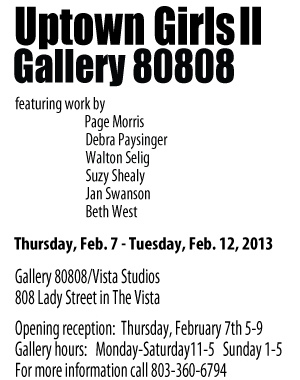 Columbia, SC—-Six local artists will show their work at the second “Uptown Girls” show Thursday, February 7,through Tuesday, February 12. The group originally came together at the Arcade where all had studios, and has now grown to six with the addition of Debra Paysinger who creates organic images in oil, and Walton Selig who explores landscapes and figures through her own language of shape, line and vivid color. Suzy Shealy will show ceramics as well as paintings and Jan Swanson, Page Morris and Beth West will show oil and acrylic paintings. 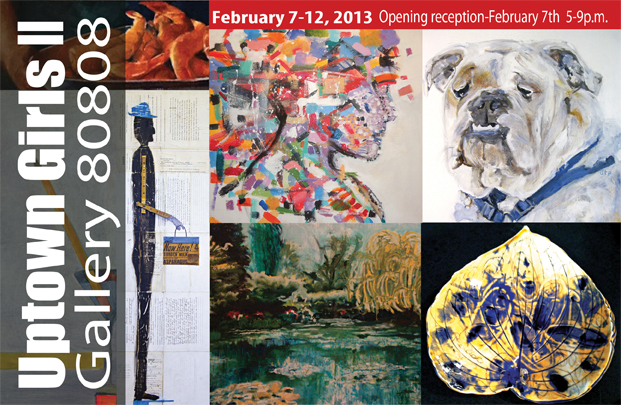 The show will open Thursday, February 7, at 5 p.m. Hours will be 11-5 Monday-Saturday and 1-5 on Sunday. For more information, please call Jan Swanson at 360-6794.